Ali Raif Pharmaceutical unconditionally supported the bike tour as a social responsibility project at 18 different places in Turkey, especially İstanbul. Meeting point in İstanbul was Sirkeci Terminal. Besides vests as gifts, bikers were given a draw number for a bike. Starting at 10 am, bikers cycled for 20 km. 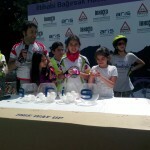 Treats were given to bikers when they arrive in Haliç. 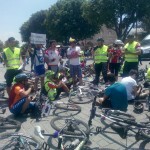 Three out of bikers who return to starting point of the event Sirkeci Terminal, attained their bikes after the draw. Later on, group arrived in Sultanahmet Square to make a statement to press. Also brochures were given to encourage cycling. Making the statement to press, Riders Association Board Member Afacan Dilekçi drew attention to the bikers’ death. 59 years old French biker Christian Jean Auguste Niaffe who passed away recently, was also remembered. Coming to Turkey after cycling around many countries, Niaffe passed away on 24 May Sunday after hit by a car in Marmaris, Muğla.